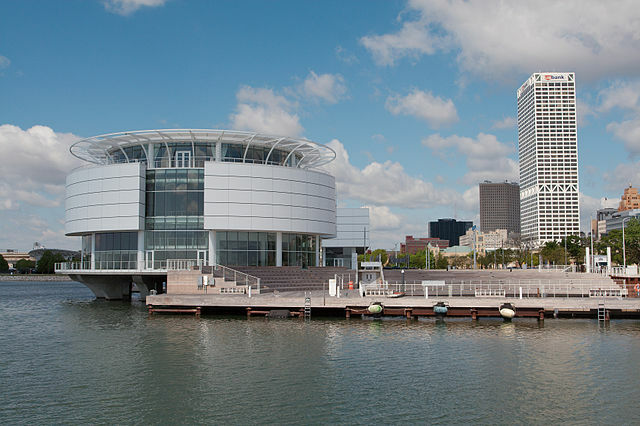 Officially opened in 1984, Discovery World emphasizes hands-on learning and scientific exploration for both children and adults. Its founder, Robert Powrie Harland, Sr., was inspired to create such a facility following Apollo 13 astronaut James Lovell’s visit to Milwaukee. 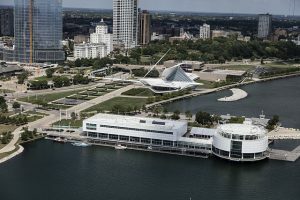 Harland, director of the Todd Wehr Foundation, worked with business leaders to establish the original museum in Milwaukee’s Central Library, where it resided until 1996. For the next ten years, the museum was located next door to the Milwaukee Public Museum. When Marquette Electronics chairman and philanthropist Michael J. Cudahy became involved in the 1990s, the museum looked to expand. In 2006, it moved to a new location on the shores of Lake Michigan along with the Great Lakes Aquarium (now called the Reiman Aquarium). It continues its mission of pairing hands-on learning with ever-changing science, technology, and economics exhibits. ^ Don Walker, “Discovery World to Honor Center’s Founder,” Milwaukee Journal Sentinel, September 14, 2011. The article did not provide a date for Lovell’s visit, but did suggest that Harland began dreaming up such a science center in the 1960s. ^ Mike Ward, “New Place to Discover: Hands-on Exhibits Shaping up in Museum’s New Digs,” Milwaukee Journal Sentinel, March 25, 1996. ^ Jacki Loohauis, “A World of Discovery: Science, Nature Get along Swimmingly at Museum,” Milwaukee Journal Sentinel, September 8, 2006.